Its a measuring instrument for measuring light permeability of all transparent and semitransparent materials such as glass, plexiglass, plastic, foil etc. 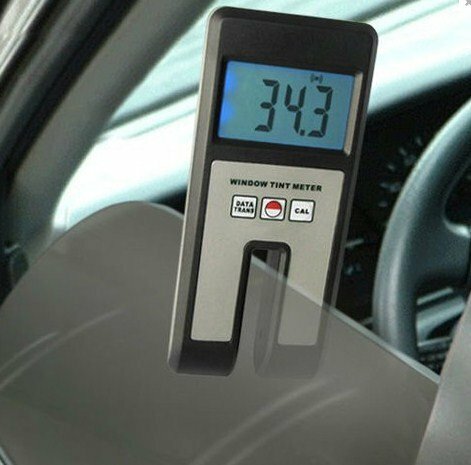 The Window Tint Meter measures the total amount of VisualLight Transmission (henceforth referred to as VLT) through a window and any coatings (tint film) on that window after it has been treated with aftermarket window film. With the optional RS-232 interface the results of measurement can be transferred to your PC or notebook. It also has an autocalibrationfunction for optimum results of measurement. Just slide down over a partially rolled down window and in seconds readings are displayed instantly on the LCD. And because it has its own internal light scource, the meter will work day or night. 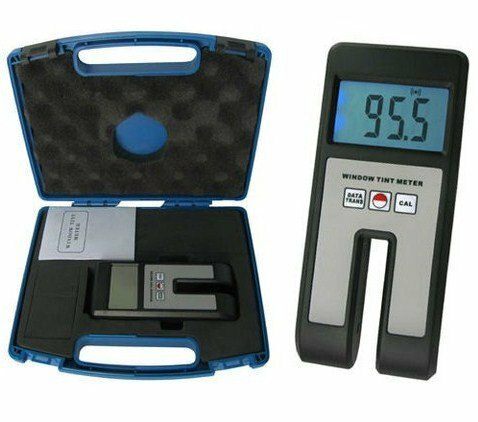 Measure the light permeability of a car or vehicle side and rear windows as well as the different glass products like windows and doors. With this equipment it recognizes whether the applied tint film at the back window or at the side windows are efficient. In addition, you'll know if the film applied abides the rules and regulations of the road in your locality. You can also determine the light loss by a plexiglass cover.